I've been reading "Terminal Hero" as I usually enjoy the writing of Peter Milligan and almost always find Piotr Kowlalski's art to be good stuff. I've liked the comic, but find it is one of those rarer occasions when I actually wish things were more, "Decompressed," as they say. Decompression in comics is nothing new. It basically means you take a storyline, scene, or what-have-you and stretch it out for awhile. 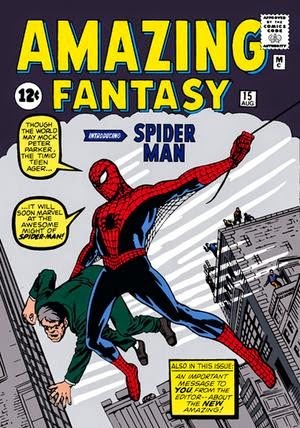 Whereas in the old days we would see Peter Parker go from a nerdy youth to a super-hero named Spider-Man in the span of a few pages, now a comic will instead spend a good six issues building up to that sort of event. 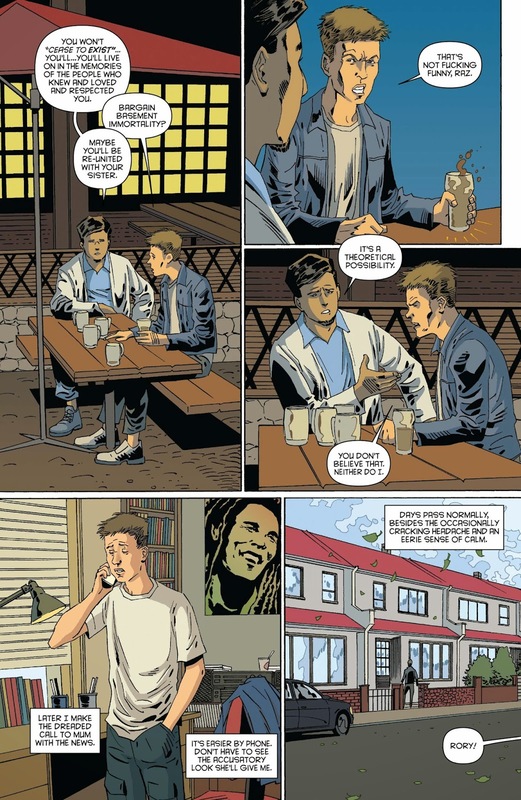 Sometimes people complain comics can feel too decompressed, with Brain Michael Bendis' "Ultimate Spider-Man" being one example of a series that at times seemed to move a bit slowly--whether with Peter Parker or Miles Morales in the lead. Then again, there are those who love "Ultimate Spider-Man" and consider it the best thing Bendis has ever written and continues to write (I think his duo of "Alias" and "Daredevil" are his best work, myself). Clearly, when it comes to decompression opinions can be mixed, with one person thinking an event comic does over eight issues what should have only taken six at the most (Secret Invasion was a slog), and others wishing the creators would take more time with a storyline, letting us fully enjoy the happenings. Nowadays it would be a number of issues before we see Spidey in his costume. I myself fall more on the spectrum of being someone who likes their stories to move along moderately snappy. As I've discussed when mentioning how I'm tired of the more mainstream comics, part of the reason is that these ongoing series paradoxically don't really go anywhere. Give me a mini-series and it seems like a ton more happens over six issues than two years of another title. This of course isn't always the case (I wish "All-New X-Factor" could go on forever and weren't cancelled with issue #20) but usually is how I feel. Therefore, imagine my surprise at how I've been reading a comic and over its three issues out of the planned six found myself thinking, "Wow, this could really benefit from some decompression." "Terminal Hero" has done more over the course of its first three issues than some comics do in a year, and it is only halfway done. In just the debut issue alone, our protagonist, Rory Fletcher, learns he has an inoperable brain tumor, has a friend with hacker-connections gain access to a recipe for a chemical cure another scientist created that might help Rory, gives Rory this cure, finds some nasty side-effects occur when Rory ends up becoming dangerously unstable (he starts getting violent urges and seeing ghostly images of his dead sister), and then Rory ends up killing his friend at the end of the issue right before being confronted by government agents. That's a lot of stuff. Oh, and the second issue has him running multiple missions for the agents, interacting with the only other person to take the cure (its inventor), having more hallucinations, and then faking his death. The third issue is relatively less crammed with stuff, instead focusing on Rory as he tries to pretend to be someone else, confronting a hallucination that claims to be his tumor made flesh, and being unaware that two other people have gained powers too--so yes, less, but still a great deal of story. A rare quieter page in the first issue of "Terminal Hero". I appreciate that "Terminal Hero" wants to give us so much content at an absurdly fast pace, but sometimes I wish it moved a little slower. Why couldn't we see more of Rory's missions? Why wasn't his tumor projecting itself as a version of him teased more over various issues and then given a big reveal later on? 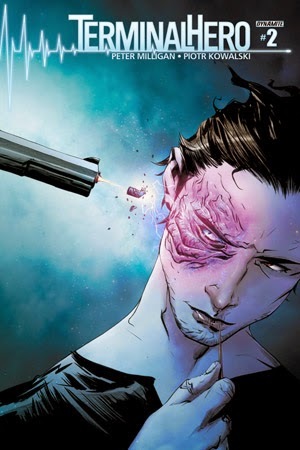 I wouldn't want a comic where we don't even learn Rory has a tumor until the end of the debut issue, but couldn't that first issue have spent a bit more time developing the characters instead of instantly starting us off with Rory learning about his condition? Perhaps I just can't be satisfied. After all, so often I complain I wish comics moved at more of a brisk speed and then I get a series that seems to dash along and want to bemoan that I would prefer it were more decompressed. Still, I just imagine that if this much has happened over only the span of three issues, what could the remaining half of the series hold? This is slated to only go those six issues, but I feel "Terminal Hero" would have been perfect given 12 or so to breathe. Then again, Peter Milligan is someone who generally does what he wants, so I wouldn't think anyone demanded he only make a six-issue mini-series, this was probably just what he wanted to do. In the end, I still think "Terminal Hero" has been a good comic so far, and even if I wish it had been a bit more decompressed I'm not that upset at how I get so much story in just a single issue. I just guess that "Terminal Hero" illustrates that for all those times I've complained about wanting my comics to be less decompressed, they could always suffer from the opposite problem. As much as I hate the saying, I suppose, "The grass is always greener on the other side," applies here quite well.